Be aware that M3 publishes primarily 3D "enriched" (= segmented, labelled, oriented, tagged or virtual restorations of damaged specimens) surface models of specimens (file format: .VTK and .PLY. We recommend to convert .STL files to .PLY files). Point clouds are not considered as surfaces. Optionally, M3 publishes image stacks produced via CT or MRI. - they will be kept informed of any new scientific publication involving these specimens. If one curator disagrees with your project, please do not include the corresponding specimens in your submission. If you have not produced (segmented) the 3D surface models yourself, you have to ask the person who did this job for his consent to distribute these data. and inform the corresponding institution(s)/curator(s) of any new scientific publication involving 3D data derived from physical specimens housed in their collections. Before submitting 3D data, make sure that you agree with the terms of this license. All original submissions are subject to double-blind peer reviews. The identity of the author(s) remains concealed from the reviewers, and vice versa. We feel that it performs at least as well as single-blind, and that it generates a better perception of fairness and equality in global scientific funding and publishing. Regarding direct contributions, as they usually directly refer to an already published manuscript or to a manuscript under review, they are only subject to single-blind peer review. Even though the review process of direct contributions is faster than that of original articles, we want to make sure that the 3D datasets published in M3 respect high quality standards. A direct contribution consists of a 3D dataset (up to 50 specimens) and of basic information regarding the concerned specimens and the 3D models. The 3D dataset has been already used and analyzed in another scientific journal. The analysis of this 3D dataset will soon be submitted for publication or is currently being reviewed in a scientific journal which asks to give open access to the original data as soon as the article is published. 1) Submit your dataset to MorphoMuseuM. For each uploaded model, M3 provides you a temporary direct download link. You may transmit to third parties these temporary download links if you need to (some journals will require that you do so). 2) Once accepted for publication in MorphoMuseuM (it should only take a few days), we will provide you a citation DOI link related to your direct contribution. 3) Please insert a reference to this DOI inside your article (this should be possible during the revision process or during the proof edition process). For instance, you may use this DOI in your bibliography. 4) Once your article is published, unlock your dataset in MorphoMuseuM. Note that your 3D Dataset will remain locked until your article is published. M3 will not give public access to your dataset until you inform us that the related article has been published. Also keep in mind that we may reject 3D datasets which have been locked for more than 6 months. This 3D dataset may also not relate to any scientific publication, but the authors or the institution owning these data want to give public access to these models. As stated above, M3 is the partner journal of Palaeovertebrata, in which we encourage you to publish your analyses of 3D datasets. As an option, you may wish to fill and attach the Specimen list table. Keep in mind that M3 primarily publishes "enriched" (= segmented, labelled, oriented, tagged or virtual restorations of damaged specimens) 3D surface models of vertebrate specimens. 3D data related to a given specimen must be compressed into one single .zip file. Each .zip file should contain at least one surface file. Please use .PLY or .VTK formats for 3D surfaces enclosed in the .zip file (please convert .STL files as .PLY files using a freeware such as MeshLab). Point clouds are not considered as surfaces. Each .zip file should not contain any subfolder. Name the files enclosed inside the .zip file in a consistent and understandable manner: for instance, prefix all file names relative to one specimen with the inventory number of that specimen. Only include once the same piece of information inside the .zip file: for instance, avoid including the same 3D surface in different formats. If you have used MorphoDig to process your 3D surface(s), we encourage you to enclose as well position and orientation files (.pos and .ori ), .tag and .flg files (if applicable, see below) and project files (.ntw). Whether or not you have used MorphoDig to process your 3D surface(s), we ask you to provide your 3D models in a biologically relevant position and orientation. You can easily achieve this easily using MorphoDig. Non positioned/oriented 3D models might be rejected for publication. MorphoMuseuM displays color legends. If your surface models contain several distinct objects rendered with different colors, or if you have colored your 3D surface files, we encourage you to enclose a .tag file inside your .zip file. You can produce a .tag file with MorphoDig or create it manually. MorphoMuseuM displays flags, which are "clickable" structures of interest. If your plan to use this feature, we encourage you to enclose one or several .flg files inside your .zip file. You can produce .flg files with MorphoDig or create them manually. line 2*n: coordinates of the structure of interest (x, y, z), flag orientation (nx, ny, nz), flag length (in mm) and flag color (r, g, b). If you have constructed manually your .flg file(s) and are not able to set flag orientation and length, you can set nx, ny, and nz to 0.0, and flag length to 1.0. CT or MRI data related to a given specimen must be compressed into one single .zip file, weighing up to 126 Mo. If your original CT/MRI dataset weighs more than 126 Mo, you may read our image stack optimization page. If you still do not manage to create a file weighing less than 500 Mo, you may consider to create a Dryad dataset instead, and to inform us that it should be linked to your submission. We recommend to use .raw format for CT/MRI Data. However, image stacks (.bmp, .tif, .dcm) are also accepted. Only include once the same piece of information inside the .zip file: for instance, avoid to include the same CT/MRI data in different formats or orientations. You may think that 126 Mo is ridiculously small for a zipped CT/MRI dataset, but then again, we encourage you to read our image stack optimization page. The manuscript of direct contributions should remain as much concise as possible. This must be on a separate page. - If the 3D dataset relates to a publication (published or under review), the abstract should refer explicitly to that publication. 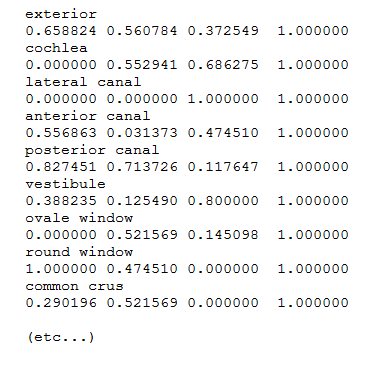 Abstract example: The present 3D Dataset contains the 3D models analyzed in: Orliac M.J. 2012. The petrosal bone of extinct Suoidea (Mammalia, Artiodactyla). Journal of Systematic Palaeontology 11(8):925-945. - If the 3D dataset does not relate to a publication, it should be about 100-250 words long and should summarize the contribution in a form that is intelligible in conjunction with the title. It should not include references. For higher-rank taxonomic units use Latin names. Keywords: The abstract should be followed by three to five keywords additional to those in the title identifying the subject matter for retrieval systems. Keywords should not exceed 85 characters and spaces. Optionally, you may wish to insert a "Results" section, a "Discussion" section and/or a "Conclusion" to your manuscript. All direct contributions published in M3 begin with a short introduction explaining the interest of the sample of 3D models. Authors may for instance briefly explain the purpose of the analysis published in the referred original article. You manuscript should contain a brief description of the procedure(s) used to produce the 3D surface models associated to your publication (e.g. manual or automatic segmentation...). Please also mention the software you have used. Example of Methods section: The 3D surfaces were extracted semi-automatically within AVIZO 9.0 (Visualization Sciences Group) using the segmentation threshold selection tool. The 3D surface models are provided in .ply format, and can therefore be opened with a wide range of freeware. We recommend the use of a tool such as Endnote or Mendeley for reference management and formatting. EndNote reference style for M3 can be downloaded here. Mendeley reference style for M3 can be downloaded here. In the text, give references in the following forms: "Sudre et al. (1989)", "Sudre (1974) said", "Sudre (1974: 28)" where it is desired to refer to a specific page, and "(Sudre, 1983)" where giving reference simply as authority for a statement. Note that names of joint authors are connected by '&' in the text. The list of references must include all publications cited in the text and only these. Prior to submission, make certain that all references in the text agree with those in the references section, and that spelling is consistent throughout. In the list of references, titles of periodicals must be given in full, not abbreviated. For books, give the title, place of publication, name of publisher (if after 1930), and indication of edition if not the first. In papers with half-tones, plate or figure citations are required only if they fall outside the pagination of the reference cited. McKenna M. C., Bell S. K., 1997. Classification of Mammals above the species level. Columbia University Press, New York. Shoshani J., West R. M., Court N., Savage R. J. G., Harris J. M., 1996. The earliest proboscideans: general plan, taxonomy and palaeoecology. In: Shoshani J., Tassy P. (Eds. ), The Proboscidea: Evolution and Palaeoecology of Elephants and Relatives. Oxford Unioversity Press, Oxford, pp. 57-75. Seiffert E. R., 2003. A phylogenetic analysis of living and extinct afrotherian placentals. PhD, Duke University. Keep these as simple as possible, with few horizontal and, preferably, no vertical rules. When assembling complex tables and data matrices, bear the dimensions of the printed page (250 x 184.6 mm) in mind; reducing type-size to accommodate a multiplicity of columns will affect legibility. Each table should be uploaded as a separate file. As an option, you may include illustrations in your manuscript. These normally include photographs, drawings, and diagrams in either black and white or color (free of charge). Use one consecutive set of Arabic numbers for all illustrations (do not separate 'Plates' and 'Text-figures' - treat all as 'Figures'). Figures should be numbered in the order in which they are cited in the text. Use upper case letters for subdivisions (e.g. Figure 1A-D) of figures; all other lettering should be lower case. All lettering should be in Arial font. Required resolution: 300 dpi at the final required image size. The labelling and any line drawings in a composite figure should be added in vector format. Figures should not be embedded in the manuscript file; each figure should be uploaded as a separate file. A single merged pdf file, containing your manuscript + all your figures and tables. Virtual restorations of damaged fossil organisms are published in this section. Emphasis should be put on the reconstruction procedure. Type specimens (up to 10 printed pages*, up to 50 specimens). Priority is set to osteological models extracted from CT-Data. Models showing segmented anatomical structures (such as teeth, bone, cavities ...) are favored. This category is designed to publish models which do not fit in one of the preceding categories, but nevertheless present enough significant scientific interest. *One page is around 7400 characters long including spaces. This is the single file that will be sent to the reviewers, so it should not contain information relative to your identity. Please also DO NOT include your cover letter, neither the 3D distribution statement inside this .PDF file. Also, for the sake of clarity, please put the figure and table captions along with the corresponding figures and tables in this document. As an option, you may fill and attach the Specimen list table. if applicable, you may also include additional documents with Supplementary Online Material. Supplementary Online Material files should be compressed into one single .zip file. Manuscript authors should aim to communicate ideas and information clearly and concisely, in language suitable for the moderate specialist. Note: all text including tables, figure captions and literature cited should be double-spaced, with line and page numbers. All original contributions published in M3 begin with a regular introduction, in which the interest of the associated sample of 3D models is presented. This introduction should may also refer to a table including a few characteristics of the device(s) out of which the 3D surface models were produced and information related to the specimen(s). You manuscript should contain a description of the procedure(s) used to produce the 3D surface models associated to your publication (e.g. manual or automatic segmentation, 3D retro-deformation protocol, surface tagging etc...). Please also mention the software you have used. All letters for primary headings are in caps (e.g., INTRODUCTION, DESCRIPTION). Only the first letter of the secondary heading and proper nouns are in caps (e.g., Inner ear morphology.). Only the first letter of tertiary headings is capitalized (e.g., Semicircular canals. ). The Zoological Codes must be strictly followed. Names of genera and species should be printed in italic. Cite the author of species on first mention. Use SI units, and the appropriate symbols (mm, not millimeter; Âµm, not micron., s, not sec; Myr for million years). Avoid elaborate tables of original or derived data, long lists of species, etc. ; if such data are absolutely essential, consider including them as appendices or as online-only supplementary material. Avoid footnotes, and keep cross references by page to an absolute minimum. In accordance with the recommendations of the International Codes of Zoological Nomenclature (ICZN), all illustrated and described specimens should be deposited in an appropriate public institution. Collection numbers must be quoted, preceded by an institutional abbreviation. These normally include photographs, drawings, and diagrams in either black and white or color (free of charge). Use one consecutive set of Arabic numbers for all illustrations (do not separate 'Plates' and 'Text-figures' - treat all as 'Figures'). Figures should be numbered in the order in which they are cited in the text. Use upper case letters for subdivisions (e.g. Figure 1A-D) of figures; all other lettering should be lower case. All lettering should be in Arial font. Required resolution: 300 dpi at the final required image size. The labelling and any line drawings in a composite figure should be added in vector format. Figures should not be embedded in the manuscript file; each figure should be uploaded as a separate file. We recommend that the cover letter includes an explanation of why the manuscript is of interest to M3 journal and what is novel about it. Furthermore, you are invited to provide a list of at least 2 suggested reviewers. In addition, you may also provide a list of non-suggested reviewers.